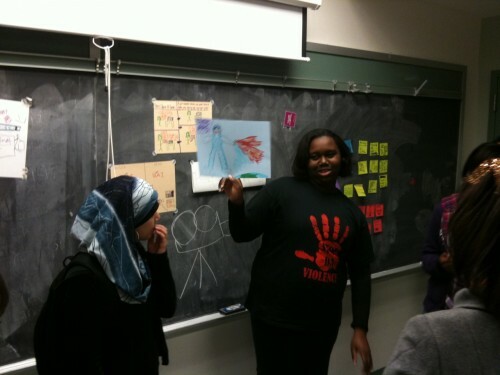 November 15th, 2010 by Katie & Carmen | Filed under students, Teaching. We had a bit of excitement in class this week! We invited two of our friends to visit our class and tell our students about what they do for a living. 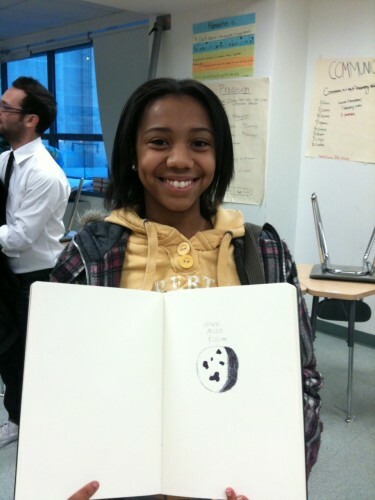 As usual, we started class by asking students to share their latest sketches in their Moleskine Sketchbooks. Rachel Abrams started by telling her story. 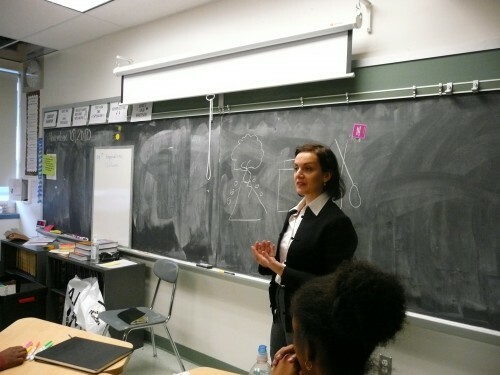 She began with a career in geology, then studied policy and lawmaking before transitioning into her work as a designer. She has a wonderful way of talking about the apparently unrelated events of her life story in a way that makes it logical that each should lead into the next. The girls absolutely adored her, especially her English accent! 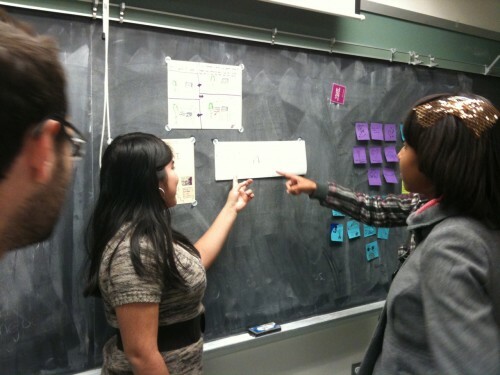 Prior to Rachel speaking, we asked the students if they knew what a design strategy consultant does. One of our students, Tessa, brilliantly described the role and we were happy knowing that we had something to do with that. 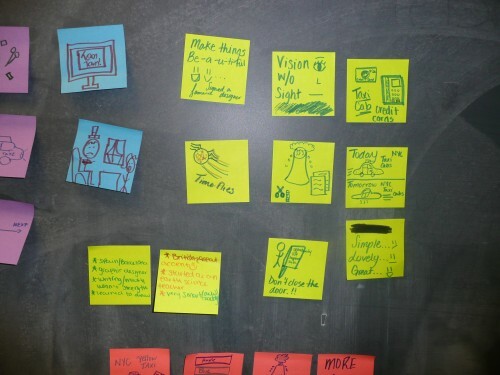 We asked the students to take notes on post-it notes during the presentations. They were able to create pretty complex little thought sketches during the time they were listening. 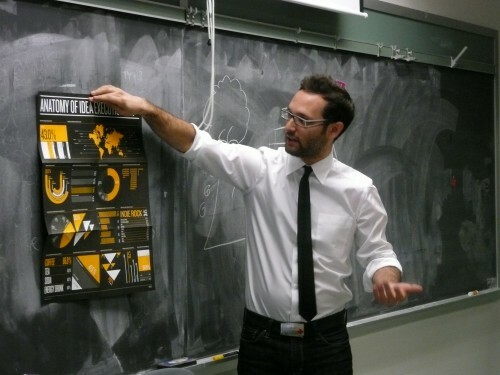 Our second guest was Matias Corea, a graphic designer and co-founder of Behance. We were so excited to have Matias join us! He started his story by pointing out everything in the room that has been touched by a designer. He talked about his evolution from being a terrible student, not into math or English or anything else, to transforming into an excellent and motivated individual through design. One of our girls wrote on a note, “He was destined to design.” If you have a conversation with Matias, you will immediately see his passion for design. We’re so happy he could bring that to our class! During the beginning weeks of Project: Interaction, we discussed ways for the girls to get to know each other. Since we have a mix of 9th and 10th graders, it is likely that the girls don’t have classes together throughout the day. We thought it was important to give them an opportunity or two to get to know each other and possibly dispel any assumptions they may have about their fellow classmates. Interviewing seemed like the best activity to do so. So for the remainder of class we randomly paired the girls up and asked them to interview each other using a set of five questions. If you had a million dollars what would you do with it? What’s the most embarrassing thing that happened to you at school? What do you want to study in college? If you had a superhero power what would it be? Name your most recent act of kindness? We then asked them to choose the most interesting response and tell a story about it. We encouraged them to tell stories in different ways, and they took our challenge! One student performed a skit, a few drew a comic strip about their story, and one student wrote her story. At the end of class we asked them to present their ideas, with commentary from our guests. We can definitely see how they girls have improved over each class. 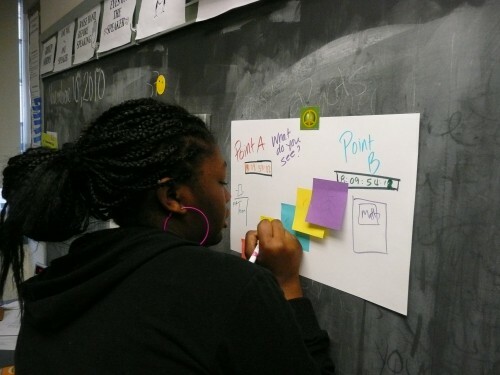 They are becoming more confident in their ideas, eager to sketch and draw their thoughts, and have continued to develop their presentation skills. We are so excited to see how far they have come since our first class! It is also always great to see the girls support each other and give positive feedback during these very quick presentations. Next week we’ll be kicking off our final projects with a workshop with Transportation Alternatives. We’re really excited to see our students put all their new skills to work!